There's nothing quite like heading out on the water in a canoe, whether that's just for a short while or for a much longer trip. If you have your canoe and waterproof clothing sorted, it's now time to look at how you can keep your gear orderly and dry. As such, we’ve come up with a list of the best canoe backpacks for a range of trips and experiences, reflecting the different space and size needs you might have. 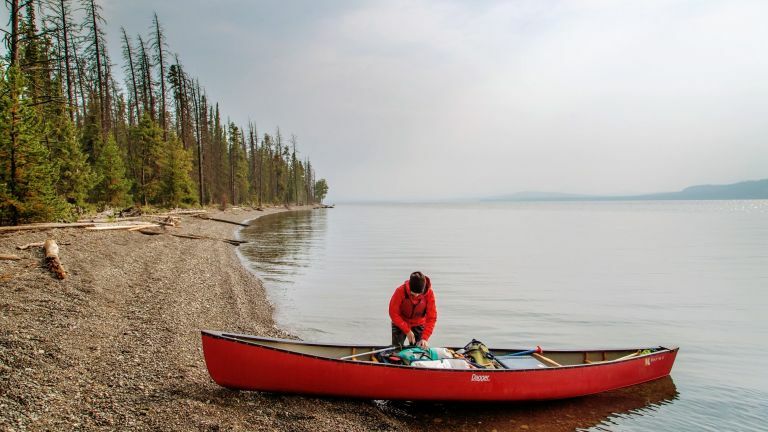 The best canoe packs are waterproof and sizeable enough to fit in various bits of gear – think helmet, towel, food, drink, and perhaps a change of clothes if you’re undergoing a longer river trek. With that in mind, we’ve placed the Patagonia Stormfront Pack at the top of our list. It’s a decent 30L, high-quality, waterproof pack that sits at a lower point on your back, which is ideal if you’re sat in a canoe for extended periods. Alternatively, those who are on the lookout for something bigger may want to check out the Granite Gear Crown2. This large canoe pack offers a whopping 60L capacity and is waterproof too. Any person who likes to spend a significant amount of time on the water would do well to check out Patagonia's super-popular Stormfront Pack 30L. Its the perfect size for shorter canoe trips, yet still offers more than enough room for food, some personal items and a water bottle. From its 100 per cent waterproof exterior to the nifty suspension system that offers up mounts for accessories, such as water bottles and torches, there’s plenty that makes the Stormfront a good fit for canoers. Padded straps and back support makes it a comfortable wear, while the inner compartment is perfect for housing an SLR camera, making it ideal for photographers looking to document their canoe trip. This Granite rucksack is 50 per cent bigger, providing plenty of space for camping gear as well as food and personal items. The Gear Crown2 is completely waterproof and comes with a hydration port and hydration sleeve, enabling you to top up on the go. The pack also features a removable lid for easy access to essentials. In short, if you're looking for a larger, built-to-last canoe pack that can take a battering from rough and tumble use, this is the one. The exterior of this backpack from Dakine is completely waterproof, with the roll top design ensuring that your belongings and food remain free from water when they're nestled inside. The front pockets are also waterproof, with PU-coated zips preventing river water and rain from working its way through. This makes these pockets the ideal place to stash your phone and other small gadgets. There’s also the bonus of a two-way purge valve for inflation, to make the bag float when needed, plus an integrated surfboard carrying system, making this the best canoe backpack for those who also surf. This neat dry bag is the perfect size for popping in the back of your canoe. It features a watertight main compartment, plus an easy access hydration sleeve for sipping on the go. Thanks to a Hardwave Suspension design feature, the pack hugs into the curve of your back, ensuring it’s comfortable to wear for longer periods of time on the water. Side compression straps also work to keep the pack load stable. Many people use the Scrambler 30 for carrying walking and skiing gear too, making it a versatile all-rounder for enjoying the outdoors. This funky looking canoe backpack has tons of space for food, clothing and gadgets. It features one large cavernous section, into which you can stuff all manner of essentials. But its precisely that one-section design that may put some people off. Once you've filled the pack with supplies, roll down the bag to secure them inside. You can also adjust the back strap so you’re not wearing the pack awkwardly when you're in or out of the canoe, protecting your posture. The hip belt is also detachable, for further comfort, and there’s plenty of attachment areas to clip on water bottles, torches and other essentials. This floatable dry pack is evidence enough that you don’t need to blow a ton of cash in order to get a perfectly decent waterproof option for your canoe. Featuring a similar roll down top and adjustable strap system to other bags sitting higher up in our best canoe backpacks buyer's guide, it will keep your belongings secure and dry while remaining comfortable to wear. It may not be much of a looker, but it’s practical, sports plenty of attachments for all of your essentials, and comes in two different capacities depending on your space needs.